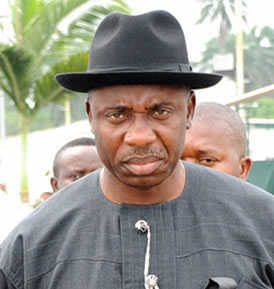 THE Rivers State Government has condemned the sudden withdrawal of soldiers from the Government House in Port Harcourt. A group of soldiers, who have been mounting guard at the Government House, were suddenly withdrawn from their posts on Wednesday, a development that caused panic among workers within the place. Speaking with FN source in a telephone interview on Thursday, the Chief of Staff, Government House, Port Harcourt, Mr. Tony Okocha, expressed shock that the soldiers could be withdrawn at a time the state government’s relationship with the police was not cordial. He described the situation as dangerous, and added that the Nigerian nation might not be able to tolerate a situation where citizens would embrace self-preservation if their security could not be guaranteed. “I was in Government House when some personnel came to tell me that soldiers have been withdrawn from Government House. What we are seeing now portends danger to our democracy and even the citizens,” he said. Speaking on the matter, the State Chairman of the Peoples Democratic Party, Mr. Felix Obuah, said some civilians had cashed in on the crisis in the state to disguise as soldiers in order to punish dissenting voices. “As a matter of fact, we saw some people in Army uniform. Some young boys were in Army uniform during the invasion of the House of Assembly. They came with camouflage Army uniform. One of them beat up a lawmaker,” he said. Meanwhile, state government said on Thursday that it had received a letter from the 2 Brigade of the Nigerian Army in Port Harcourt, explaining the reason behind the withdrawal of soldiers from the Government House. Okocha, told the source in a telephone interview that the Army claimed that some soldiers were in company with the governor during the brawl in the State House of Assembly.